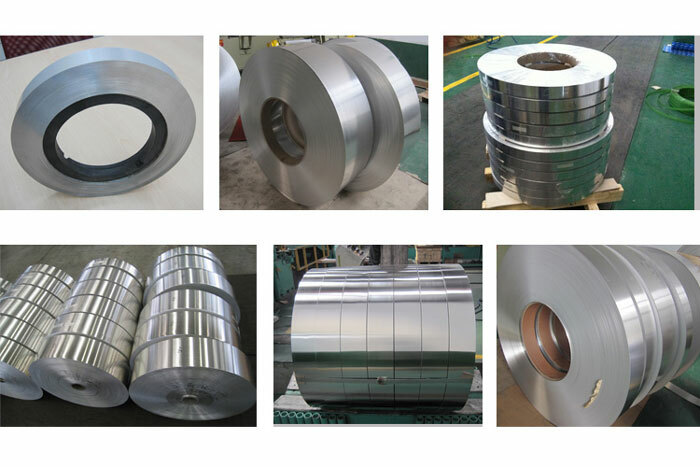 Aluminum strip is a kind of narrow coil product of aluminum alloy, although it is processed from aluminum coil, but the thickness of aluminum strip can be thin as aluminum foil, so in some applications, aluminum strip can also called aluminum foil tape. While in some areas, aluminum strip have same performance of aluminum coil, so it is called as aluminum coil strip, aluminum strip coil and narrow aluminum strips. Aluminum strips have wide application in industry and life, today we will introduce tho typical kinds of them. Aluminum Strip for transformer winding must be the most widely application in industry, the aluminum strip used for processing transformer winding is with round edge and without burr, the aluminum is mainly pure 1000 series aluminum, take 1060 aluminum as the example, the temper is O, it is soft and have high conductivity, so aluminum foil strip are the best material for making transformer. Another application of aluminum strips for lamp base. Aluminum lamp base must be punched and then tapping into spiral shape, the material is thin and must withstand some pressure, so the material needs to have high mechanical strength, uniform micro structure and deep drawing performance, thus 3000 series aluminum like 3003 and 3004 aluminum are good choice.